I "met" Shannon (of Prep Avenue) about a year ago through blogging. We had very similar styles and shared a love for all things navy and pink (I instantly fell in love with her Instagram). We collaborated on a fabulous collection of prints for the Preppy Printshop and when I discovered she was going to be studying in Italy this summer, we decided we had to meet up in Florence. 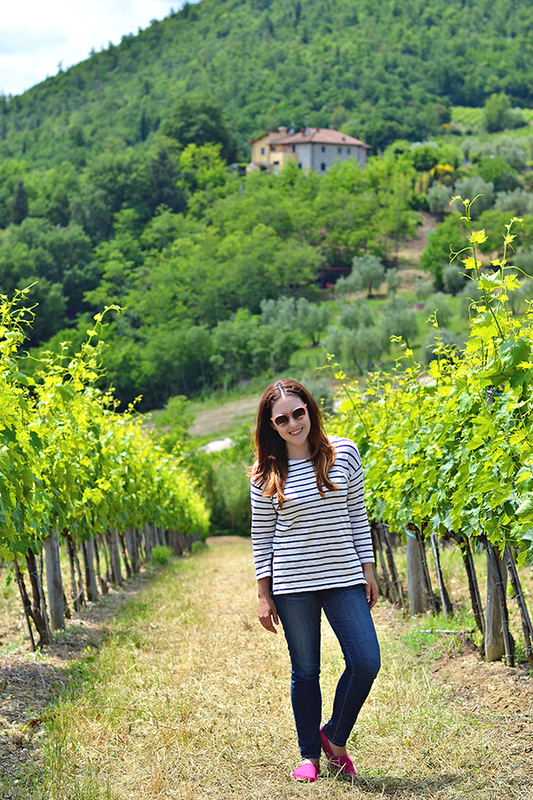 I knew that Shannon only had a couple days in Florence with her program and I wanted to show her another side of the area -- the gorgeous Tuscan countryside. 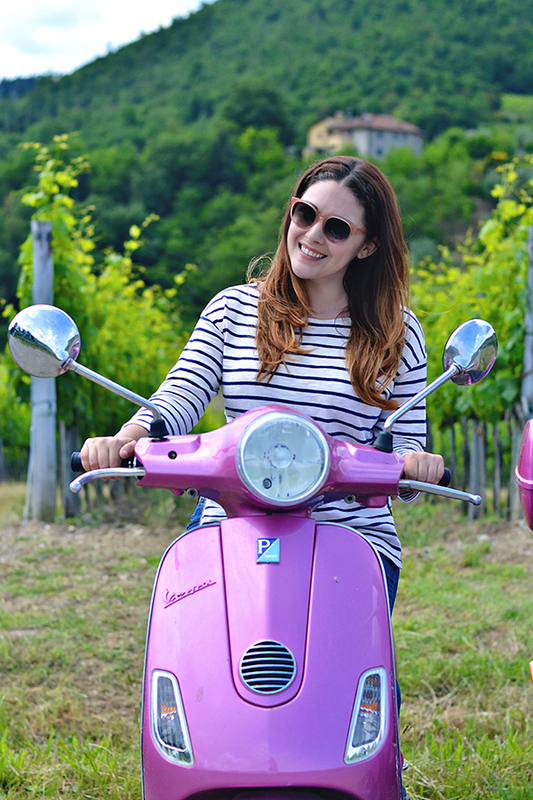 And of course, there is no better way to explore said countryside then on matching hot pink Vespas! 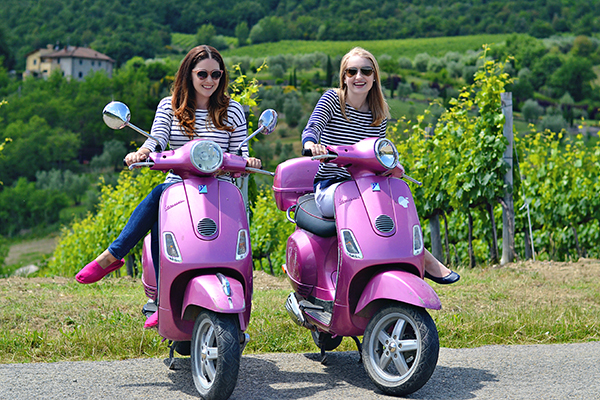 We both shrieked with excitement when our guide told us he had exactly two pink Vespas. 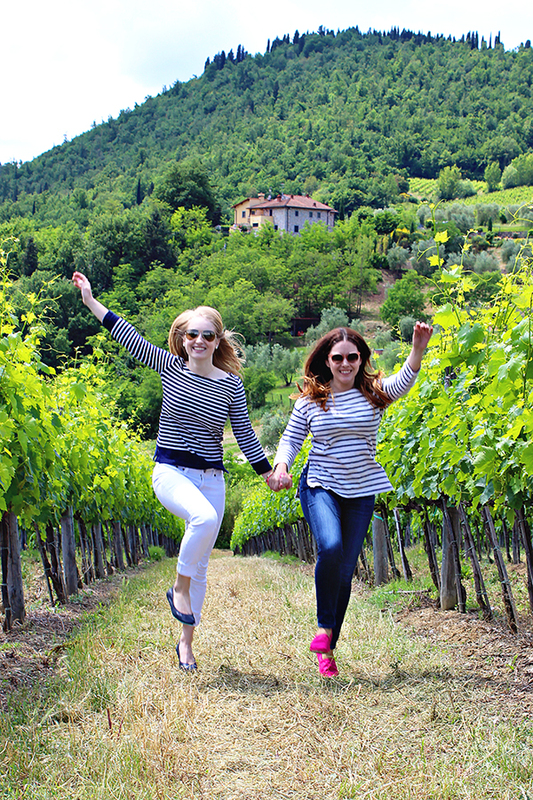 We spent last Tuesday morning zipping through the countryside of Chianti stopping for lots of photographs and frolicking through vineyards. 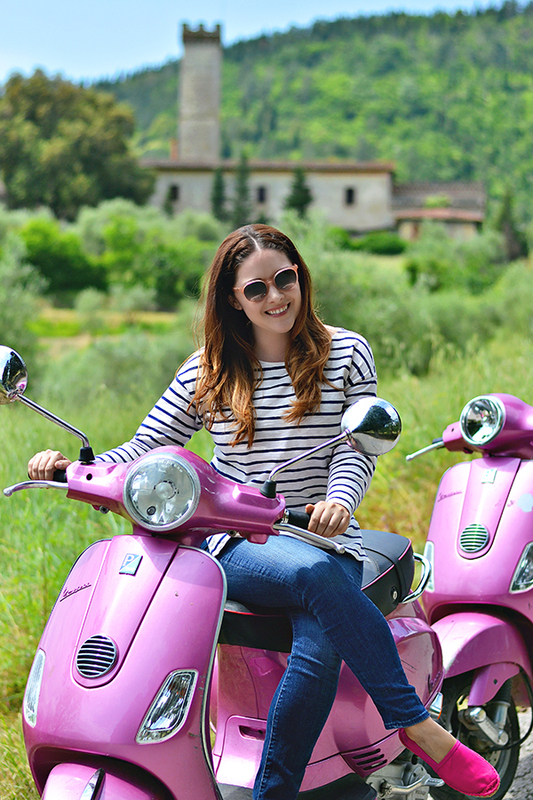 If you are visiting Florence (or any city in Tuscany) you must visit the countryside, and there is no better way then by Vespa (pink if you're lucky). 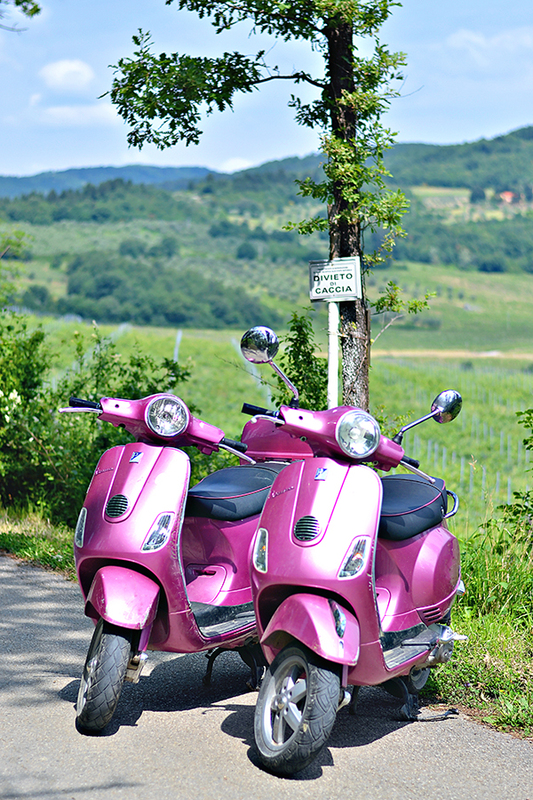 This was my second Vespa tour in Tuscany, and like my first, it did not disappoint. 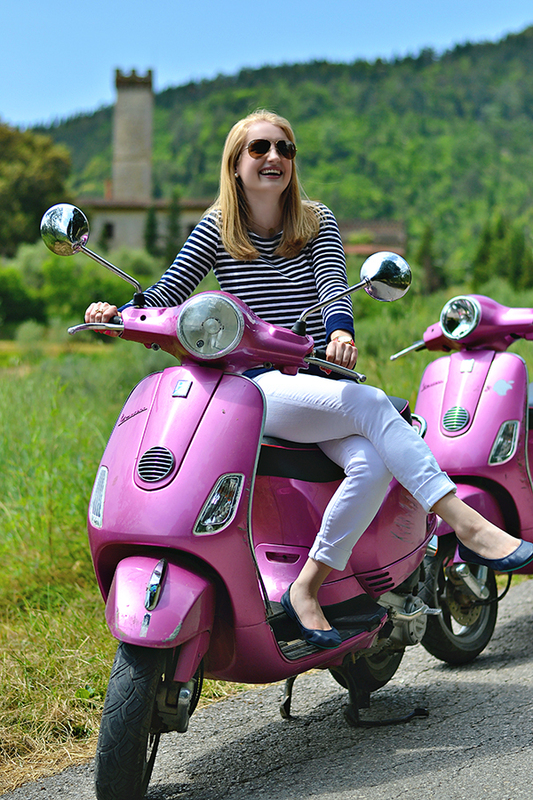 Shannon and I did our Vespa tour through Tuscany Cycle, a fabulous company located in the center of Florence that offers Vespa and bicycle tours of the countryside daily. Their prices are incredible for what you get and because they are centrally located in Florence, you won't lose an entire day of sightseeing (Shannon even made it to class that afternoon). You meet in Florence for your tour and the friendly guides transport you (via car or mini bus) the Chianti Fattoria di Lavacchio, an organic farm that produces its own wine, olive oil, fruits and vegetables. From there you begin your adventure with a driving lesson (don't worry you can do it) before ridding off into the countryside. The ride is customized to your liking. So if you are like Shannon and I, then you can make tons of stops to take a million pictures. 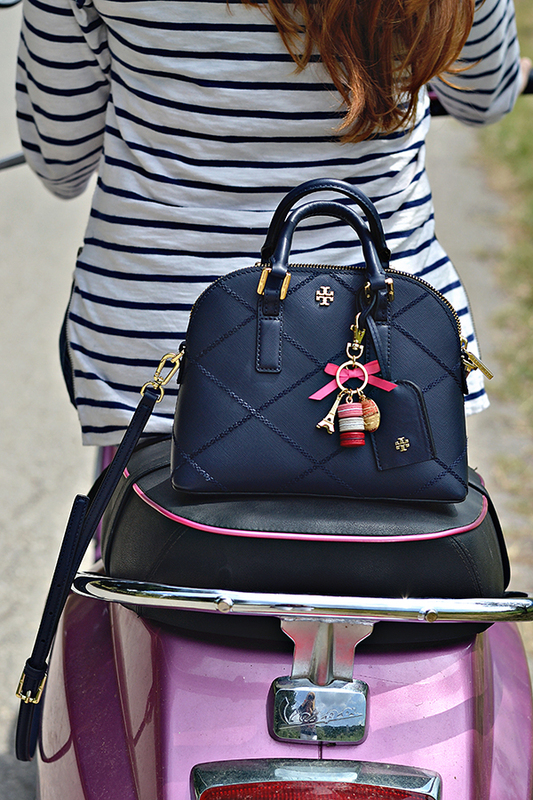 Or, if you prefer to let loose on the open road, you can just enjoy the ride through the amazing countryside. 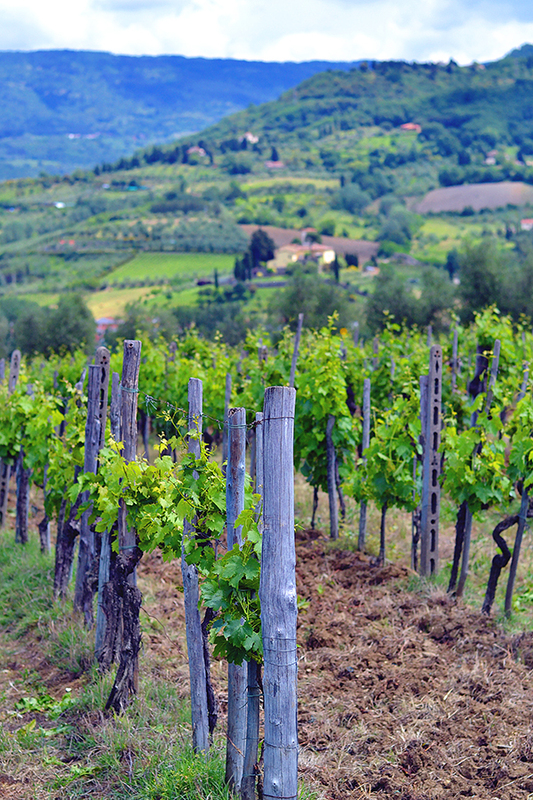 The Chianti area is littered with picturesque villas and vineyards, it is hard not to fall in love. The tour uses mostly back roads so there is no need to worry about traffic. It really is a stress-free and enjoyable ride. After a couple hours of driving, you make your way back to the farm for an amazing three-course lunch (local Tuscan dishes and ingredients of course) and a wine tasting on a gorgeous patio overlooking the vineyard. Our guide even taught me how to open a prosecco bottle with a sword lol. I think Shannon really enjoyed the experience and I liked actually getting to meet her in person. The day was filled with laughter and constant exclamations that, "this really is the most perfect day." Shannon and I connected just as quickly in person as we had online and we have already discussed meeting for coffee and pain au chocolat in Paris later this month! Thanks Shannon for a fabulous day! And a very special thanks to Tuscany Cycle who really made it a day to remember! Have you ever driven Vespas?